If you’re not ready for Valentine’s Day, there’s no time like the present to start making your plans. Dinner reservations and tickets to romantic events on the 14th of February should be done weeks beforehand! If you think all you need to do is walk in to a florist and grab a bouquet of roses after work on Valentine’s Day, you’re wrong—in fact, you’ll probably find that every florist in town has sold out of red roses by that time! So please order early so you get a good choice and lock in your delivery date. Valentine’s Day is often associated with giving flowers, but that’s not all that you need to worry about. Planning the day or the entire weekend depends on your relationship and your favorite things to do. And keep romance in mind. Romance is all about the details, being thoughtful and sweet and savoring all that is good in your relationship together. Valentine’s Day does not always have to be dinner and show and an evening out. Sometimes it can be a nature walk, a picnic in the park, a leisurely afternoon at the art museum or Netflix and popcorn. What makes it romantic is the thought you put into it. The level of planning and anticipating all the little joys you are trying to give your sweetheart on the most romantic day of the year! And we’re ready to help you get the perfect Valentine’s Day flowers for your date. 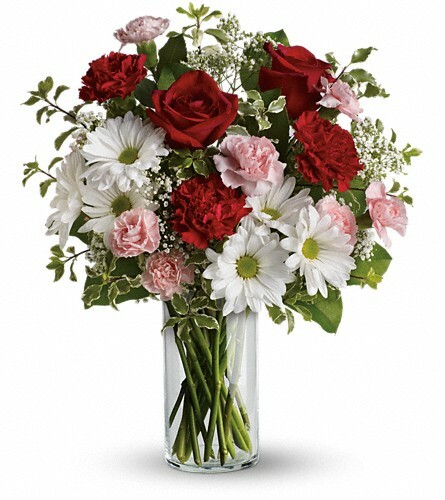 We’ll deliver the perfect Valentine’s Day flowers in Asheboro, NC, on Valentine’s Day or even during the week! Administrative Professional’s Day is April 23. It’s the one day out of the year that employers take the time to show their administrative professionals just how much the appreciate everything they do for the office. There are many different ways to show this appreciation: take them out to lunch, give them the day off, or give them small gifts like candy, flowers, or even a nice bonus. There are some great quotes by administrative assistants and professionals that are perfect for Admin Professionals Day, but there are some that are certainly not! Here are some that might be appropriate to write in cards you give your administrative professionals and some you should certainly not! Are you ready for Administrative Professionals Day? If not, we can help with the flowers in Asheboro, NC. Christmas is coming! There’s a lot to do this holiday season, but in between the shopping, decorating, and wrapping, you should stop to enjoy some of the different activities going on in Asheboro. Here are some different things you can do to make the season a little more magical. Take the kids to see Santa! He and his elves will be appearing in many different locations around Asheboro, including many malls and department stores. Check local listings to see where he is. Some of the local parks and city districts have huge light and decoration displays you can drive through. Some neighborhoods are also well-lit with bright and creative decorations. Be sure to take your camera to take pictures of some of your favorites. There are a number of different holiday shows going on in Asheboro and surrounding areas, too. Classics like “The Nutcracker” and “A Christmas Carol” shouldn’t be missed, especially if you’ve never seen them before. Don’t forget to order a great bouquet of Christmas flowers delivered in Asheboro, NC. Many families have Thanksgiving traditions they do every year, even if they don’t really think of them as traditions. Some are rather easy: they fix a specific dish, for example. Some families use dishes that have been handed down for years. Others use traditional recipes for certain dishes. If you don’t have any Thanksgiving Day traditions, it’s not too late to start one. You can create any tradition you want. The only important thing is that you do it each year on Thanksgiving. Some traditions are simple, such as saying what you’re thankful for each year before you eat. You may even decide your family’s “tradition” is to skip the traditional formal dinner with turkey and dressing in favor of getting Chinese takeaway or making homemade pizza. You can create whatever Thanksgiving tradition you want! Need a centerpiece? Let us deliver gorgeous Thanksgiving flowers in Asheboro, NC to your home! Don’t forget a Halloween centerpiece! We deliver amazing Halloween flowers in Asheboro, NC. Now that autumn is here, it’s time to take a look at the colors of fall and what you can do with them! The colors of fall are the colors of fall flowers and falling leaves: red, orange, yellow, and brown. Some people also add in deep green, dark purple, and even a little bit of dark blue. Using these colors as accents with the traditional fall colors can really make them pop. These colors are bold and powerful, so you may want to use them sparingly. Want to order some beautiful flowers to add to your theme? We have some amazing fall flowers in Asheboro, NC. While some of the more well-known and popular flowers bloom during the summer, the late summer and fall months have just as many amazing flowers. Late summer actually features some flowers you won’t see any other time of the year. Here are just a few of them. • Cleome is a fun perennial that grows to be four feet high! Its colorful flowers will appear anywhere between July and September. • The Bee Balm is a bright pink flower that may actually bloom all summer if it’s carefully cultivated. If not, it will bloom during the cooler days at the end of the season. • The Anise Hyssop can be planted between other flowers. While it’s not a bright flower that draws attention to itself, it does bloom some pretty purple flowers in the late summer and early fall months. • The Lobelia cardinalis has beautiful cascading red blooms that almost look like tiny little red birds. • The Ammi majus, also called Bishop’s Weed, looks similar to Queen Anne’s Lace. It’s a great flower to actually plant during the hottest summer months because it blooms and quickly fades during the late summer and fall. • One of the more popular late-summer flowers is the zinnia. It grows in many areas and brightens up the early fall. • Morning Glories are another beautiful flower that grows in areas that get a good amount of water. They bloom in a number of colors. Want some of these late summer flowers in your home? Give us a call and we’ll deliver a gorgeous late summer bouquet to you in Asheboro, NC. The summer heat certainly takes its toll on flowers. While the summer is the best time to see many of them bloom, it’s also a time when your outdoor flowers require a little more TLC. Here are some tips that will help you keep your brilliant flowers alive during the hot months. • Keep your flowers watered. Water in the evening or on overcast days (if there are any!) to avoid wasting water (it will evaporate during the hot afternoon). • Deadhead your flowers after they are done blooming. This can make some flowers bloom even more spectacularly later. • Cut back blooming perennials. Like deadheading, this can make your flowerbeds look better and will encourage new growth in the flowers themselves. • Don’t forget to fertilize your flowers. Fertilizing your plants during the summer will keep them healthy and blooming. • Cover your flowers during severe storms. • Bring in any potted flowers during major storms. Want to bring some of these amazing flowers indoors? We deliver summer flowers in Asheboro, NC. Do you have any fun plans for the Fourth of July? If you don’t, it’s not too late to make plans. Here are a few ideas for activities to do on Independence Day. • Play volleyball, basketball, or badminton. • Cook out on the grill. • If it’s too hot to be outdoors, stay inside and play board games. • What your favorite movies. • Go watch a fireworks display. • Attend a Fourth of July concert. • Have a picnic for dinner. • Take a trip to the lake to swim or fish. • Set off your own fireworks! • Organize a block party. • Visit a war memorial or museum. With Mother’s Day coming up, it’s that time of year that we think back on everything mom taught us. One of the ways she prepared us for the real world was by giving us a lot of rules to live by. Some of them seemed very harsh at the time, but it’s obvious she was just looking out for us. Here are a few rules that might have seemed crazy, but they were her way of keeping us safe. • No snacks before dinner! Mom knew that we had to eat right to grow and stay healthy. That’s why she made us eat our vegetables and not snack before meals. • Brush your teeth before bed! Again, this was her way of making sure we would develop healthy habits that would serve us throughout our lives. • Don’t stay out past a certain time! Establishing a bed time helped us set our schedules. It’s just a fact of life that most of us have to be up and to work, and mom helped us get into that habit by giving us a strict bed time. • Do your homework first, then you can play. While we probably didn’t like it, this did teach us to prioritize and to get our work out of the way before we do other things. • Do your chores! It might have seemed like mom was using us for child labor, but chores are a great way of learning responsibility. Actions, or lack of action, have consequences, and if we didn’t do our chores, we learned what those consequences were. These are just a few rules mom had to help keep us safe and healthy. What was in your mother’s rule book? Have you adapted any of her rules for your own children? Don’t forget to thank mom for everything she did by sending her some brilliant Mother’s Day flowers in Asheboro, NC.